Hello! It's time for another Mojo Monday sketch (#278), and it's Round or Square week. Today's fabulous sketches are brought to us by Julee. I used the square sketch to make a birthday card for my dad, whose birthday is this Thursday. This card came together fairly quickly once I figured out which patterns I wanted to use and rearranged them a few times. I used Birthday Bash (balloons and sentiment). Once I layered everything, I stamped the balloons and then pieced them, adding some foam tape to make them pop up. Accessories: A Cut Above Dies: Pennant Trim Die (Verve), Standard Circle and Scalloped Circle Nestabilities (Spellbinders), Ribbon (May Arts), Wood veneer star (Studio Calico), Foam tape, Thread, Sewing machine. I really like the neutral palette with that pop of colour in the ribbon! Super stitched detail too! Beautiful card, Steph!!!! Love the pieced balloons and your stitching is fabulous!!!! What a fabulous mix of papers and love that you used yellow for the pop of color! Your dad will love this! So beautiful, Steph! I always love your stitched details and that little wooden star on the pennant trim is so cool! Oh wow, that is just gorgeous!!!! a beautiful card, Steph! Your card is gorgeous. Your stitching is incredible!!! And I love the colors which is perfect for a masculine card - which I'm sure you're Dad will love this one. Those balloons are just adorable. Sharp Card! Like that it can be a masculine Birthday card. What a fun card Stephanie! 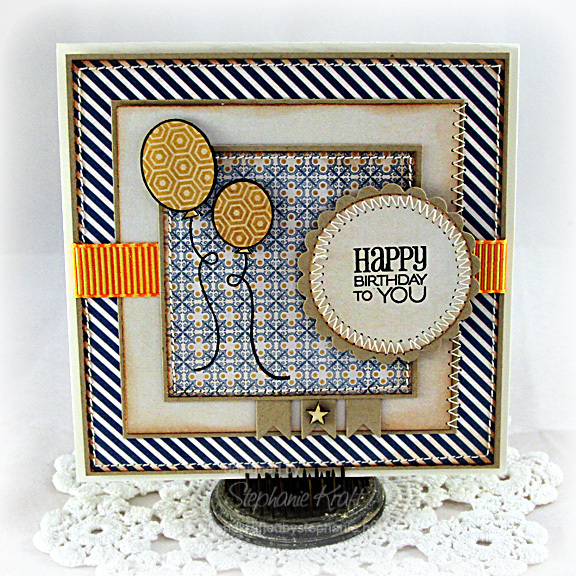 Love the balloons and mix of patterned paper! Thanks for the inspiration! Your card is beautiful, I love those ballons and the paper choices. Lovely card! Like your style! Hi Steph! I loved the sketch and decided to play along! YOUR card is FAB! LOVE how you combined those Patterned papers and the star on that banner with the FUN balloons! Great card! so very pretty!!! Your stitching is fabulous!